J ohn Grisham pretty much holds a monopoly on courtroom thrillers for adults. He’s become a household name. I mean, what adult hasn’t read at least one of his books or seen a movie based on them? In this series, he’s trying his hand at the children’s genre. My recommendation? Stick with adults, John. 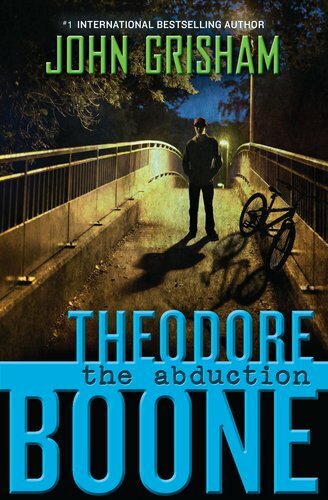 In The Abduction, Theodore Boone is a thirteen-year-old who wants to become a lawyer like his parents. He lives and breaths law. He likes to hang out at the courthouse. He knows all the cops and judges in town. He even has his own office in his parents’ firm and tries cases in the Animal Court. Now, I’m not saying there’s never been a kid who digs law with this level of committment, but I haven’t met one. This character just didn’t feel realistic to me. In fact, the whole book felt unemotional, stilted and matter-of-fact. It’s a mini-version of his adult books, with adult narration (it reads like a newspaper), adult passions (like golf and trials) and an adult subject (kidnapping and murder). Theodore isn’t a kid; he’s a miniature adult. Yet, as an adult I didn’t like the book either, because it’s too short and predictable. There are no gritty details, no twists, no courtroom drama that make Grisham’s adult books great. He had to leave those out to make it appropriate for kids. But the ingredients that make a children’s book great are also absent. There’s no imagination, no beauty, no imagery. I wasn’t even impressed with the action or suspense. In creating an adult book for kids, he’s created something mediocre at best. I don’t understand why it hit the best-seller list. I suspect it has more to do with his name and reputation than the book’s appeal. This is the second in this series. I have not read the first, Theodore Boone: Kid Lawyer, nor will I. It sounds like he didn’t take the change of the audience (readers) so well. I didn’t think he translated too well. Grisham’s adult books are so gripping, I was disappointed. But Sir Books reviewed this same book last week and gave it 4/5 shields. A matter of opinion, I guess. Maybe this would be interesting to a 13 year old. It sounds a little disappointing.